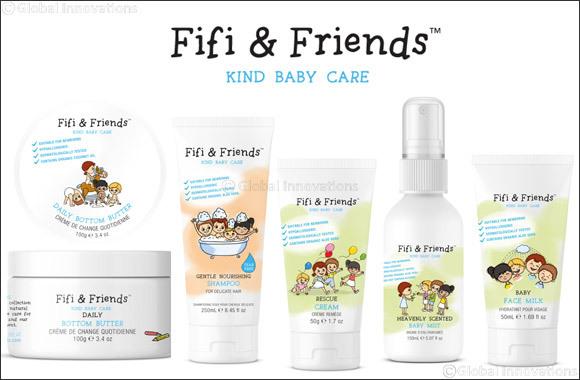 Dubai, UAE, October 15, 2018: When it comes to caring for a baby's skin and hair, Fifi & Friends stands out as a favourite among mothers in the UAE because it keeps both mother and child in mind when creating the right solutions. To cater to the increasing demand for its products in the UAE and to make them easily available, Fifi & Friends will now be available at even more retailers including Carrefour, Five Little Ducks, Level Kids, mumzworld.com, babyshopstores.com and thetoystore.com. Fifi & Friends was created by businesswoman and devoted mother, Tamara Ecclestone who was inspired by her daughter, Sophia (Fifi), to create a collection of natural and effective bath & body products that are hypoallergenic, vegetarian (most products are also vegan) and wheat-free, all free from parabens, sulphates, and silicones. This Sweet Almond Oil infused face moisturizer gently hydrates even the most sensitive of skins. Clinically proved to be safe for baby, it contains organic Aloe Vera which soothes and helps to protect. Formulated without alcohol. This naturally fragranced baby water refreshes your baby's skin, whilst organic Aloe Vera soothes. Ideal to also spray on linen and their toys for a comforting, soothing scent. This highly protective bottom butter is ideal for daily use, formulated for baby's delicate skin. Helps protect skin from diaper rash. This intensive, multi-use, nourishing barrier cream provides a protective layer to help restore skin back to its soft and supple condition after any rashes or irritation. The formula contains moisturising Shea Butter and Olive Oil and works wonders on cheeks irritated by teething.